The longest running chess tournament in the world, the 89th Hastings Chess Congress came to an end in a 7-way tie. 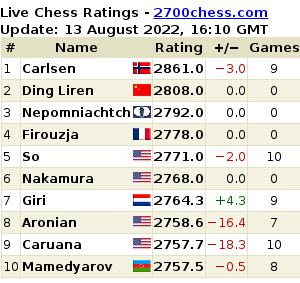 High profile participants in a 7-way tie GM Ma Qun of China, GM Mikheil Mchedlishvili of Georgia, GM Igor Khenkin of Germany, GM Mark Hebden of England, IM Jahongir Vakhidov of Uzbekistan and IM Justin Sarkar of USA and FM Jovica Radovanovic of Serbia all scored 6.5 points out of 9 games. 89th Hastings Chess Congress started on 28th December 2013 and continued till 5th January 2014. Although this year’s event was not very impressive, yet it came to an end with interesting features. The competition saw participation of four top seeds that were not only from England but from Georgia, Igor Khenkin (2598) of Germany, China, as well as Poland. The local hero of the chess congress was Mark Hebden (2560). Other nationalities also were seen which included Bangladesh, Jamaica, Kazachstan, New Zealand, Singapore, USA, and Uzbekistan. The Danny Gormally English grandmaster started with three straight wins at the 89th Hastings Chess Congress. Eventually, he fell back slightly with two draws and finally it was top seed Mchedlishvili who grabbed sole lead with the following win in round 5. Mchedlishvili and Khenkin are popular as open tournament tiger grandmasters who are famous for playing a big number of open tournaments throughout the year. These players are ultimate professionals and present wonderful yet simply strategies to their opponents. The first Christmas Congress was held in the year 1920-1921 and it was won by four-player double round-robin of British Champions. It was won by Frederick Yates 4.0/6 further on of Roland Henry Vaughn Scott, Henry Ernest Atkins, and Richard Griffith. Hastings Chess Congress have always a most visited even. Many chess enthusiasts over the world flock to the tournament to witness the gala.